Make your Chicago stay even sweeter and book a room with a deluxe winter treatment at these hotel spas. Looking to get away to a relaxing Chicago hotel spa? Indulge in your choice of treatments and relaxing surroundings with these luxe options for a day at the spa in Chicago. Named #1 Hotel in Chicago by Travel & Leisure, The Peninsula Chicago recently upped their game with an extensive room refresh in 2016 that spared no expense. Of the many guest perks, the spa is a favorite and also takes wellness to the next level. Spanning the 19th and 20th floors of the landmark Michigan Avenue property, the 15,000-square-foot oasis has eight spa treatment rooms and suites. Stimulate the flow of Qi energy within the body with a Bamboo Harmoniser massage, one of the Asian-inspired treatments. Follow that with a dip in the indoor half-Olympic length swimming pool which is flooded with natural light, or take in the sunshine fully at the adjacent Sun Terrace. Take the elevator to the eighth floor and step out into pure pampering. Make a stop at one of four movie-screening manicure nail stations and nibble from the brownie buffet before you head to your treatment room overlooking Lake Michigan. Book the Carrot & Sesame Body Buff and enjoy a hot oil rubdown, warm milk and honey drizzle, body wrap, and sesame seed and sea salt scrub followed by a vichy shower. 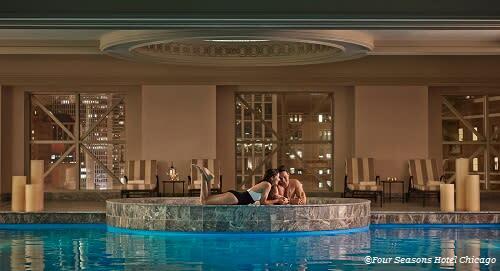 Dripping in luxury, this Magnificent Mile relaxation oasis is known for employing lush ingredients. Call on the healing power of precious minerals and gemstones with a Sjal Skincare Signature Gemstone and Crystal Facial. The holistic 50-minute treatment uses rose quartz, platinum, copper and nano-gold as well as sapphires, rubies and diamonds to restore winter skin. Take your spa day to the next level with one of the hotel&apos;s 53 luxury spa guestrooms. Secluded on two floors, the rooms feature direct spa access and include amenities such as heated eye and neck pillows. Unwind with the Ultimate Urban Body Mask, a 90-minute treatment using detoxifying herbal mineral salts, a blue-green algae body mask and a massage application of detoxifying cypress, rosemary and grapefruit aromatherapy oils. Book this pet-friendly River North hotel for its year-round pool, nightly wine reception and stone&apos;s throw art galleries, restaurants and nightlife options. Schedule an in-room spa service and relish in customized care and organic products. The Revitalizing Hot Stone Massage will balance your body&apos;s energy, stimulate circulation and melt away tension. Casual, quiet and urban, the Spa@theWit knows how to counter balance winter. Their Fountain of Youth spa package includes an 80-minute youthful glow facial, shine and buff pedicure and manicure for a total of 2.5 blissed-out hours of personal attention and indulging.